Will 2018 be the Year of the Feminist? “A new day is on the horizon . . . the time when nobody ever has to say ‘me too’ again”, preached Oprah Winfrey at the 75th Annual Golden Globes. The social magnitude of her feminist-oriented acceptance speech for the Cecil B. DeMille Award, which will surely go down in history as one of the greats alongside Martin Luther King, highlighted both the progress and the length of the journey ahead for the #metoo movement. 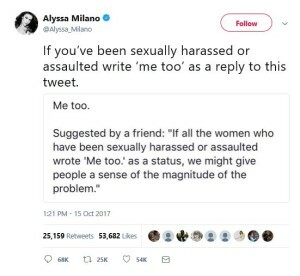 #metoo is a dynamic social media campaign started by Alyssa Milano, which showcased just how far and wide sexual harassment has spread. Thousands of women (and men) have used the hashtag to join the feminist conversation on sexual harassment. This followed the shattering exposure of the sexual harassment allegations against Harvey Weinstein in late 2017. Ashley Judd was among the strong women who came forward and prompted an uprising against the rigid power structure of Hollywood. The red carpet turned black for the 2018 Golden Globes, with female stars banding together to mourn the imminent death of the patriarchy make a stand in solidarity with those who have experienced sexual abuse across the globe. Meryl Streep, Emma Watson, Millie Bobby Brown and Natalie Portman were among the quietly empowering protest. The delicate power structure has started to crumble, and gender disparities are beginning to reveal themselves in a multitude of formats. Several worthy female candidates, including Patty Jenkins, who directed the hugely aesthetic and successful Wonder Woman, were bypassed in the candidate selection for best director. In one of the highlight moments of the Golden Globes, Natalie Portman called out Hollywood for nominating only men for the prestigious award. 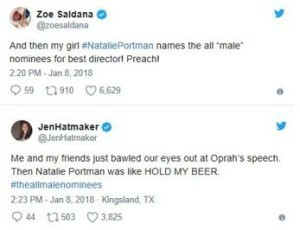 Standing demurely in her black dress alongside Ron Howard, Portman smiled at the crowd and savagely announced: “here are the all-male nominees.” Howard’s eyes went straight to the floor and the audience cheered loudly – but possibly the highlight of her quick rebellion was the Twitter storm that followed. In 2017, women also called out wage disparity. We saw Lisa Wilkinson assertively walk away from Channel Nine after losing negotiations to earn the same as her male co-host, Karl Stefanovic. This trend is continuing this year, with Australian actor Abbey Lee commenting on her experience of working alongside a male who earns more purely based on his gender. She also acknowledges that this behaviour is not exclusive to the entertainment industry, but a serious paradigm that exists across most industries. Everything we need to end this exists now – but we need to believe every woman who comes forward by placing the blame on the harassment culprits, not the victims. We’re sitting on the fourth wave of feminism, which is characterised heavily by the digital environment. Each of us, regardless of gender, feminist status or occupation, has the responsibility to use our social media presences to drive the movement forward, to create a safe and equal society for all. This means we need to believe the women who come forward, because, despite everything that’s happening around us now, those brave ladies are still copping criticism for not coming forward sooner, or being openly dismissed or disbelieved.